Imagine you’re a high school student. Tonight, you have a couple hours of basketball practice. Your history teacher also assigned a paper on the industrial revolution. Using the internet to do your research when you get home should make it go quickly, however, so you’re not too worried. But imagine that there is no internet access at home. What do you do? Go to the library after practice? But it closes early and you’ll need dinner. Search the town for free public Wi-Fi spots? But it can take hours to find a spot that is free to use and has reliable service. Just not complete the assignment? But that will hurt your grade. For millions of underserved students this is the dilemma they face nearly every day. The homework gap forces students out of the comfort and safety of their homes in search of an internet connection to complete their homework. It means millions of students are unable to do independent research, work on shared documents, connect with teachers and classmates, and submit assignments online from their own homes. This is an issue impacting millions of students. In fact, according to a study by the Family Online Safety Institute, 49% of students say they have been unable to complete a homework assignment because they didn’t have access to a computer or the internet. 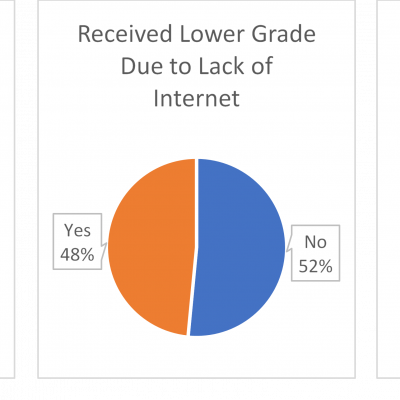 42% of students say a lack of internet access caused them to receive a lower grade. Students are well aware of this divide: 80% say that students who do not have access to the internet have an unfair disadvantage to those who do. 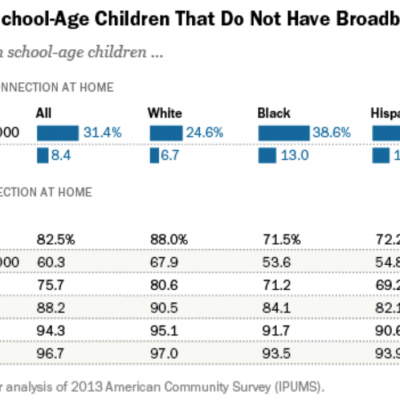 Home internet access appears to have a lasting impact on the success of students. A 2008 study by the Federal Reserve found that high school students who have broadband internet at home have graduation rates 6-8 percentage points higher than students who don’t. Students with internet access at home also tested 24 percentage points higher than their disconnected peers. School districts have started to recognize the importance of leveling the playing field by ensuring that students have equal access to the resources needed to succeed. 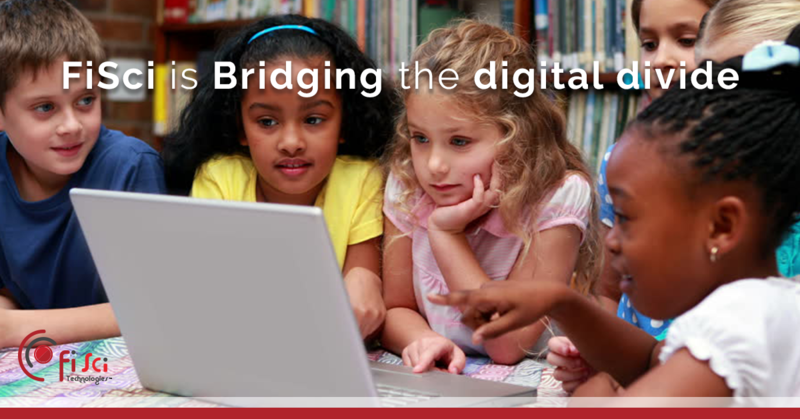 In today’s digital world, the best way to do this is by increasing home internet connectivity and closing the homework gap. School districts across the country are looking for solutions to expand internet service and make it more affordable. Companies, like Sprint and AT&T, have stepped in to provide both devices and access. This, however, is not enough to bridge the digital divide for many students who lack not just a device, but access. Also the service packages they offer are still not affordable to many students that are under poverty line. School districts have taken steps further to close this gap, largely by deploying a private LTE network mostly on EBS or CBRS spectrum to cover on and off campus areas and providing devices like MiFi, Customer Premise Equipment (CPE), or LTE enabled laptops for underserved students to use at school and at home. FiSci Technologies, a leading private LTE solution vendor can take part in. FiSci Technologies seeks to overcome the two major factors that prevent students’ households from having internet: the cost to build and the complexity to maintain a private LTE network. At FiSci, we provide the full end-to-end LTE infrastructure at an very affordable price. The small cell form factor Base Station provides both targeted area coverage and high capacity-driven scenarios in a very cost-effective way. Cloud based LTE core, aka, EPC eliminates prohibitive upfront CAPEX expenditure and enables quick launch of service. Plug-and-Play features for both eNodeBs and devices and dedicated technical support will provide ease of mind to IT teams of the school districts. Therefore the Total Cost Of Ownership (TCO) for school districts to build a private LTE network is significantly reduced. This makes building the network much more cost effective than using the services from major service providers, and it allows a much greater number of families and students to afford internet access. FiSci doesn’t seek to bring internet access to underserved students as a charitable donation. Instead, serving the underserved is a core part of who FiSci Technologies is and what we aim to do. FiSci’s mission is to enable our internet service provider partners to expand their LTE networks to rural areas to bring internet service to those who need it. With this mission guiding us, we will partner with public and private organizations to bring reliable and affordable internet to millions of underserved households. Together, we will open new doors for underserved students nationwide. Do you see students in your community struggling with this issue? Leave your thoughts below! Most areas of the islands of Hawaii are provisioned with traditional DSL, Fiber or Cable Broadband solutions. However, the issue is both the monthly cost and the required 3-Year service terms required by some providers for even the basic $14.95/mo 11×1 Mbps internet service to lower income families. Many of the low income families that have fallen on bad times have defaulted on the payment for less essential services like internet access and now find it difficult to reinstate or start new service even at a new service address. In regards to the Cost Of Living, Honolulu currently ranks 6th out of 99 most expensive places to live in North America (https://www.expatistan.com/cost-of-living/honolulu). And with the average household at 2.7 people the Median income is at $67,905 (https://www.point2homes.com/US/Neighborhood/HI/Honolulu-Demographics.html), it is very difficult for the lower than median income families to afford internet connectivity for their school age children once they pay for Honolulu housing costs, food, transportation, electricity (Highest cost for electricity in the nation http://www.newsweek.com/most-expensive-place-live-us-hawaiitoilet-paper-costs-more-628977) and other basic expenses. Housing in Honolulu is expensive. Honolulu has some of the highest costs for rent in the nation. The average apartment rent within 10 miles of Honolulu, HI is $2399. One bedroom apartments in Honolulu rent for $2025 a month on average and two bedroom apartment rents average $2761 as of December 2017 (https://www.rentjungle.com/average-rent-in-honolulu-rent-trends/). While you can find cheaper apartments with more basic accommodations, the challenge is that the availability of those cheaper living quarters is very limited within 10 miles of Honolulu. Many live outside of Honolulu and endure some of what has been rated as the worst traffic in the nation (http://www.hawaiinewsnow.com/story/18599683/honolulu-ranked-worst-in-country-for-traffic). Many choose to live in crowded Multi-Generation Family conditions. This in turn causes a strain on the basic internet connections that they can afford. And for those that can afford only the basic level of internet service, they have very high (and somewhat unrealistic) expectations of what those lower basic service levels can provide them. While consumer education helps them to understand why their internet service cannot support their large family of users, they are still in a situation where they can’t afford what they really need in terms of Bandwidth to support their larger household. My heart goes out to these families. And while I would like to be instrumental in providing an alternative and affordable internet access to these families, I can’t see a way to do so and stay in business in Honolulu. Any input, suggestions or help would be appreciated!